Traeth Mawr01286 672232work BeachLocated on the North Anglesey Heritage Coast, the small harbour village of Cemaes is the most northern village in Wales. There are two great beaches Traeth Mawr (meaning simply 'Big Beach') and Traeth Bach (meaning 'Small Beach') offering safe bathing, golden sands, and rock pooling for the children. Traeth Mawr is a sheltered sandy beach cradled by a small promenade walk, with the Afon Wygyr (river) feeding into the sea on the west side of the beach and glorious Pre-Cambrian geology framing the east side. On the opposite side of the river is the harbour pier which is ever popular for crabbing. The promenade, a popular place for strolling which also has easy access for wheelchairs . Cemaes beach is an attractive destination for sailing and there are boat trips on offer here to many destinations around the island. Popular watersports include kayaking and windsurfing. A range of local shops, cafes and pubs are available in the pretty village just behind the beach. The Anglesey Coast path runs through Cemaes in both directions. The scenery to the west is some of the most remote on the island and the route takes in the National Trust owned Nature Reserve at Cemlyn, while to the east the footpath follows rocky clifftops with spectacular views. Located on the North Anglesey Heritage Coast, the small harbour village of Cemaes is the most northern village in Wales. 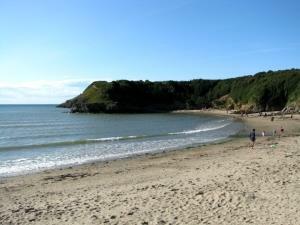 There are two great beaches Traeth Mawr (meaning simply 'Big Beach') and Traeth Bach (meaning 'Small Beach') offering safe bathing, golden sands, and rock pooling for the children. Traeth Mawr is a sheltered sandy beach cradled by a small promenade walk, with the Afon Wygyr (river) feeding into the sea on the west side of the beach and glorious Pre-Cambrian geology framing the east side. On the opposite side of the river is the harbour pier which is ever popular for crabbing. The promenade, a popular place for strolling which also has easy access for wheelchairs . Cemaes beach is an attractive destination for sailing and there are boat trips on offer here to many destinations around the island. Popular watersports include kayaking and windsurfing. A range of local shops, cafes and pubs are available in the pretty village just behind the beach. The Anglesey Coast path runs through Cemaes in both directions. The scenery to the west is some of the most remote on the island and the route takes in the National Trust owned Nature Reserve at Cemlyn, while to the east the footpath follows rocky clifftops with spectacular views. Pay parking. Dog restrictions May to end September. Junction 8 of the A55 for the A5025 to Amlwch; continue on this road and turn right where signed for Cemaes. Follow the road down into the village and turn right where signed for parking.